There was tons of exciting news in Waterloo over the last month. That made choosing just 10 stories a challenge, but we did it anyway. New updates to Ontario’s automated vehicle pilot program allow some automated vehicles to hit the road with just one passenger on board or a remote operator monitoring operations. The announcement was made in Waterloo, which is home to a robust AutoTech community and Canada’s largest university-based automotive research centre, WatCAR. Read the full story. 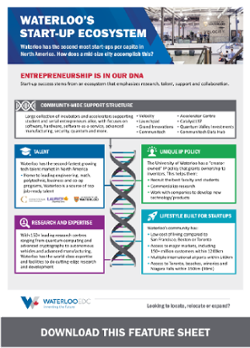 A new report from the University of Toronto’s Impact Centre identifies five Waterloo companies that hold the potential to explode onto the world stage, including the possibility of becoming Canada’s newest “unicorn.” We wrote about this story here. 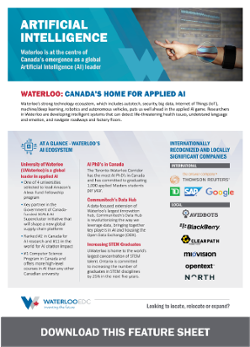 A new report from Current magazine ranks the University of Waterloo 4th in the Americas for innovation in Artificial Intelligence (AI) and robotics. Other universities making the list include the Massachusetts Institute of Technology (MIT), Carnegie Mellon University, University of Southern California, and the University of São Paulo. We wrote about this story here. One of Waterloo’s fastest growing companies, North (formerly Thalmic Labs), made headlines with the release of their new augmented reality glasses, Focals. In January, they announced the shipment of their first products and pop-up storefronts to sell outside of their main showrooms in Toronto and New York. Read the full story. Tech giant IBM recently claimed that they are at the head of the pack in the pursuit of the world’s first quantum computer. Prominent members of Waterloo’s world renowned quantum ecosystem – dubbed Quantum Valley due to its full research-to-commercialization ecosystem – disagree. Read the full story here. Workers displaced by artificial intelligence and millennials who like to switch jobs are a new focus for D2L, the Waterloo tech company that develops online learning platforms. Read more about why they expect corporate clients to exceed education clients in the next few years. Velocity, the most productive startup incubator in Canada, is shaking up the way it supports startups by replacing a grant model with one that allows angel investors to make direct equity investments in local early-stage companies. Read the full story. In January, the Blackberry – invented and manufactured in Waterloo – turned 20 years old. Not only is this company still innovating, but its talent has helped fuel Waterloo’s exploding startup scene for more than 15 years. This story reflects on the “first smartphone’s” importance. The founders of Aurora Quantum Technologies – formerly Q Spice Labs – have decided to move their growing quantum business to Waterloo. Read this story to find out why. Canada has positioned itself as a leader in artificial intelligence, with the University of Waterloo’s AI Institute leading the charge. This story looks into the potential implications for a country that may soon find itself becoming an “AI Superpower.” Read the full story. Want news updates as they happen? Subscribe to our blog today! We regularly post about some of the most exciting news coming out of Waterloo. Just fill out the subscription form on the right side of this page.